Poulin + Morris' graphics program for Gibney Dance uses dimensional forms and bas relief sculptural effects to reflect the movement implicit in the dance company's work. 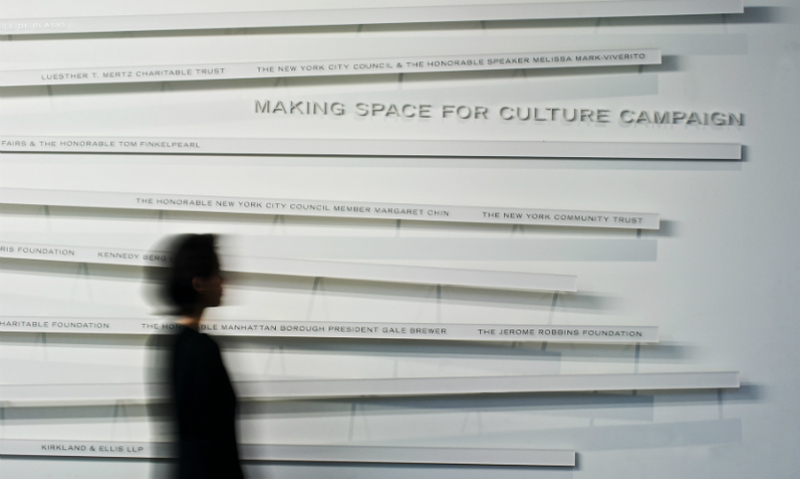 The center's donor recognition wall features a series of horizontal bands at various angles, displaying donor names in five neutral shades of gray to differentiate the giving levels. The center and its major benefactor are also identified with angled bands of horizontal type, mimicking the Gibney Dance logo. The names appear to jump off the wall in a visual play on movement. Large-scale graphic treatments also appear on the center's storefront and on glass rehearsal studio walls. Angles and dynamic type treatments also appear in signage. 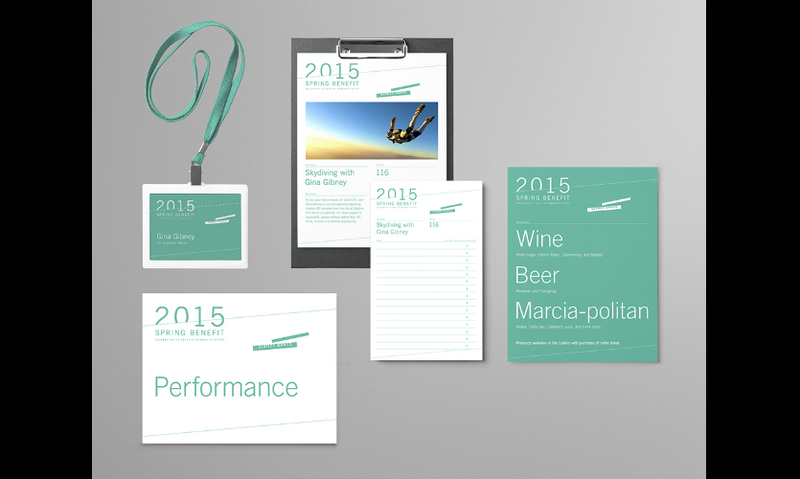 Poulin + Morris extended the graphics to collateral for the company's 2015 benefit. Print and digital media for the event included save-the-date announcements, invitations, programs, silent auction bid sheets, and menus. 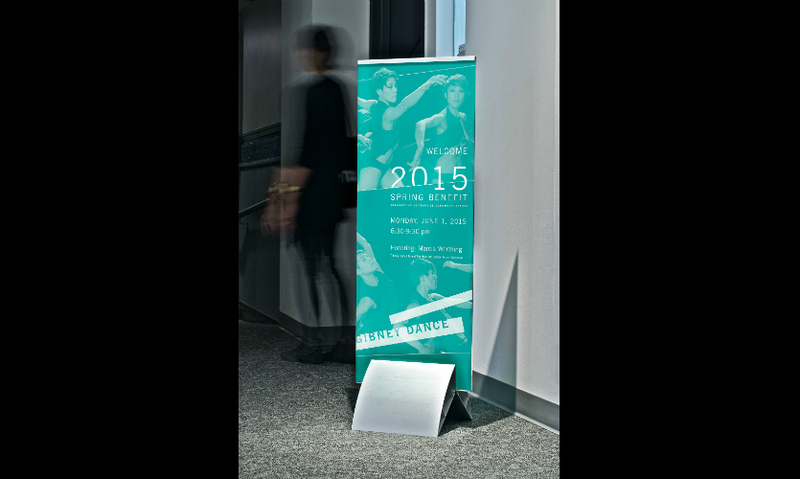 P+M used dynamic photography and a vibrant color palette for the events media, including temporary signage. Gibney Dance was founded in 1991 as a non-profit dance company with a mission to use movement, creativity, and performance as a way to effect social change and personal transformation. Two decades later, it strives to create and perform engaging work in a cooperative community, and has been involved in a myriad of social issues including domestic violence. Originally based at 890 Broadway in Manhattan’s Flatiron District, the company recently signed a 20-year lease for additional space at 280 Broadway in Lower Manhattan, the former home of Dance New Amsterdam, in an effort to save invaluable space for the city’s dance community. While both venues will continue to provide affordable studio rentals to dance companies, Broadway productions, and performing artists, the 36,000-sq.-ft. space at 280 Broadway will focus on training emerging dancers and features a digital media center, a state-of-the-art performance lab, and a black box theater. 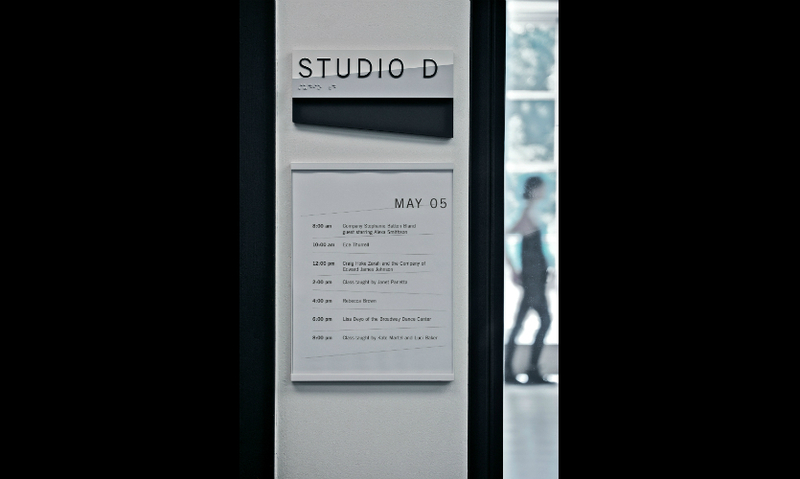 Poulin + Morris worked closely with Gibney Dance in developing a comprehensive environmental graphics and donor recognition program for the new downtown facility. Taking Gibney’s existing logotype of two horizontal bands set at dramatic angles that reference modern dance movements, P+M expanded on the concept of motion for the new program. 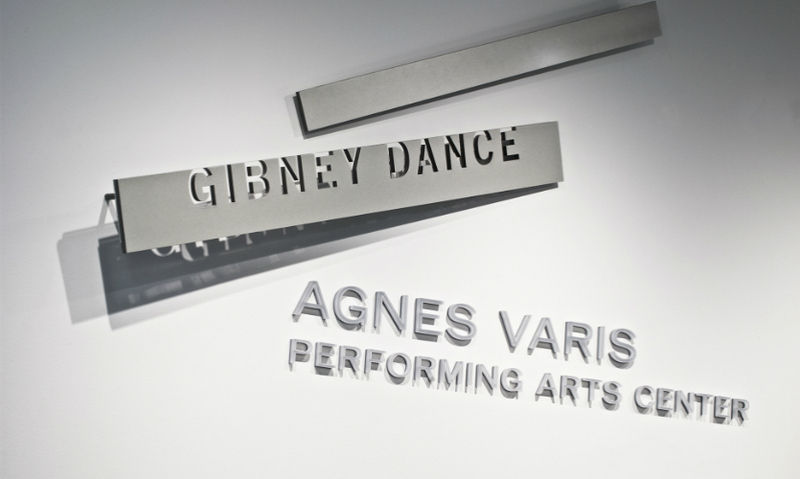 Using materials culled from the building’s interior architectural palette, sign panels composed in stainless steel, painted aluminum, and cast resin mirror the varied angles found in the Gibney Dance logotype. 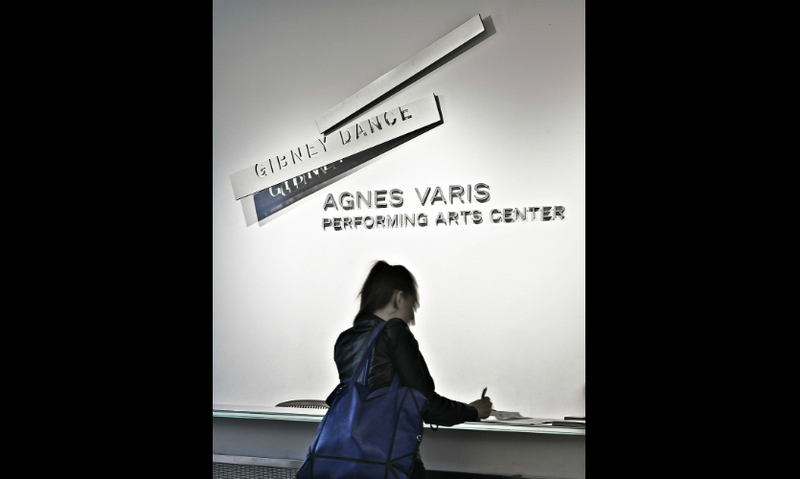 To identify the new space, as well as acknowledge its major benefactor—Gibney Dance and the Agnes Varis Performing Arts Center are realized in three-dimensional typography and horizontal bands placed at opposing angles and located above the main reception desks. The donor recognition wall, located on the second floor of the center, also features a series of smaller horizontal bands organized at various angles, displaying donor names in five neutral shades of gray to differentiate the donor levels. 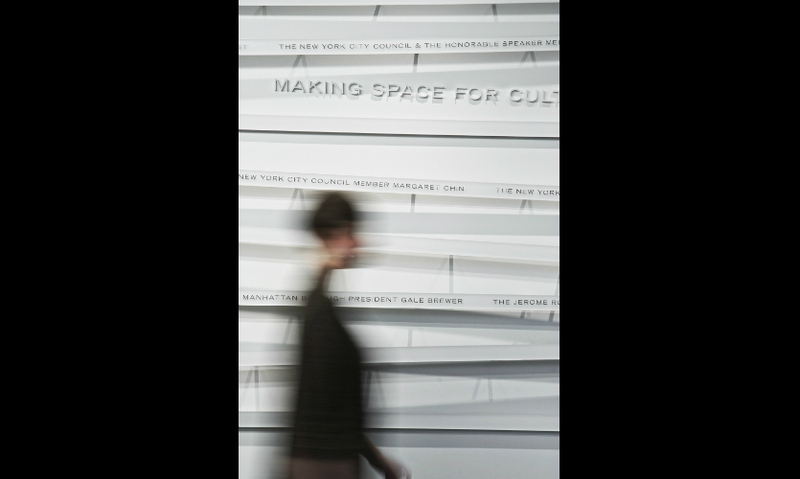 Applied to white cast-resin panels that are the same white as their backdrop wall, the names appear to jump off the wall in another visual play on motion and movement. 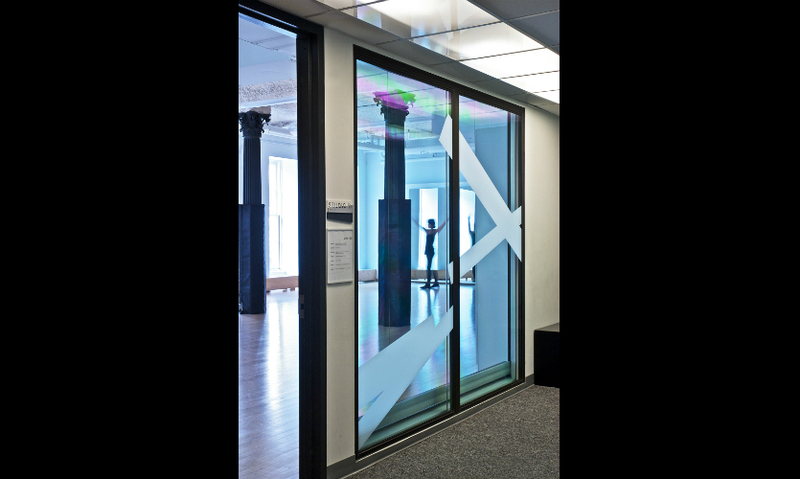 Large-scale graphic treatments also provide identification and branding on the center’s exterior glass storefront, as well as privacy for rehearsal studios and offices. These visual treatments, composed in translucent white vinyl, feature varying levels of transparency and clear cutouts for visibility into each interior space. “Using dimension and bas-relief sculptural effects creates a strong metaphor for movement throughout the program and captures the vitality of the Gibney Dance mission,” says Richard Poulin,FSEGD, firm principal and designer on the project. 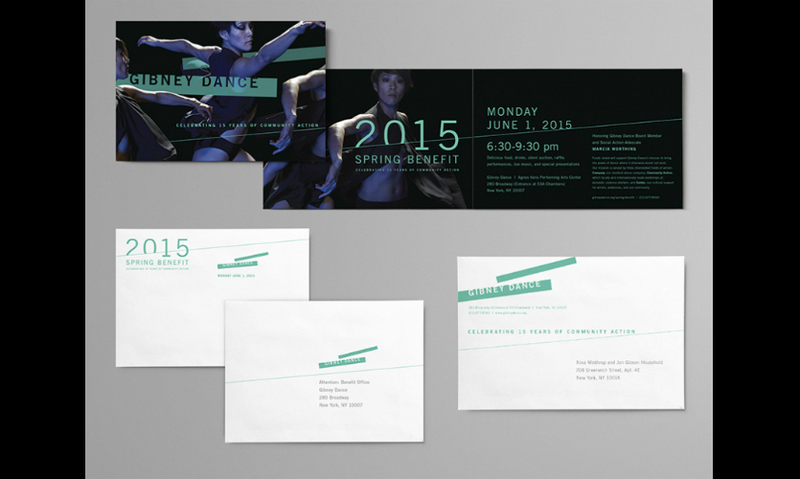 P+M also created event graphics for the first annual fundraising event held at the company’s new home. Expanding on the environmental graphics program for the new facility, P+M developed print and digital media for the event including save-the-date announcements, invitations, programs, silent auction bid sheets, menus, and temporary directional, informational, and wayfinding signs welcoming guests to the benefit. 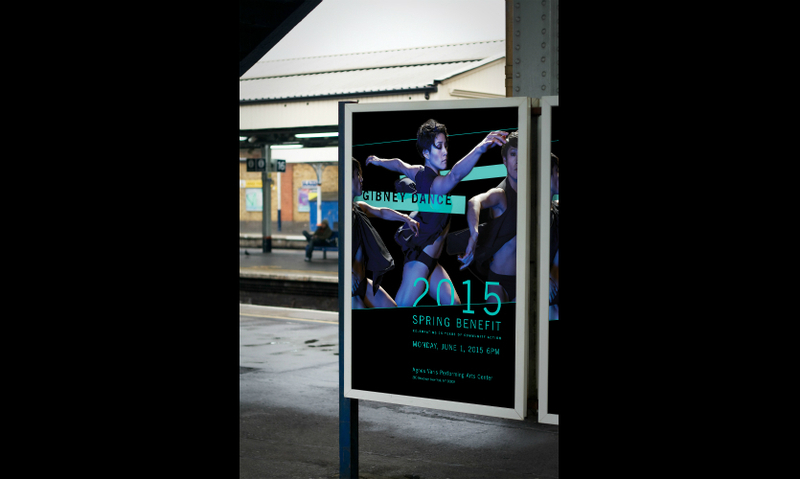 Dramatic photography of Gibney dancers coupled with a vibrant color palette and intersecting typographic forms were used to create a series of striking, kinetic visuals promoting the Spring 2015 Benefit. >> Find more great content in your areas of interest in SEGD's Xplore index,searchable by practice area and industry category!